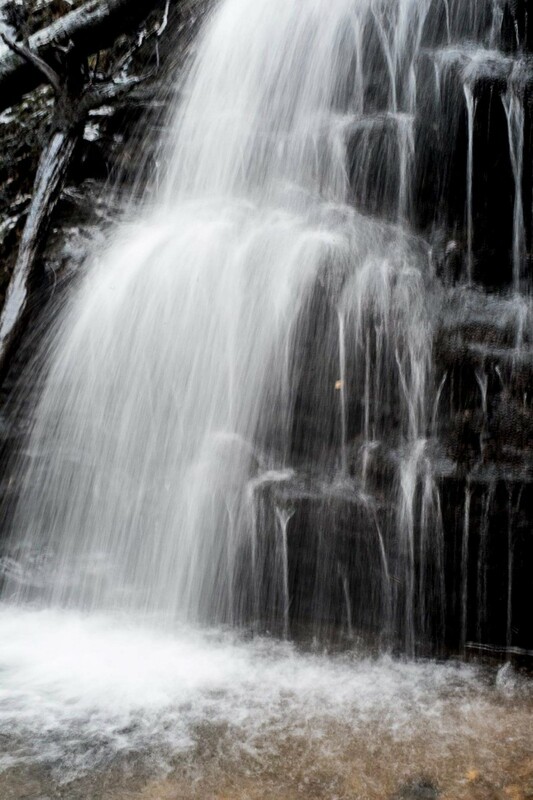 6) Conservation of Upper Cormonachan, the old village and access to the Cormonachan Waterfalls with 2 km of new access paths from the Contemplation Shelter and joining up with the forest road to the west of the woodlands and a new car park by Cormonachan Burn road bridge to commence in 2019 onwards. The cost of this project will be £269,570 + VAT and close to 95% grant funding should be available. 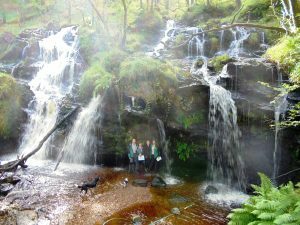 The Cormonachan Woodlands Association has therefore now launched the “Upper Cormonachan Paths” Project Fund on 8th January 2019 where we would like to raise £13,500 that is 5% of the project costs. We have now received £3,363.10 in donations to the fund which is very encouraging. Donations will be very welcome! Major funding will be sought by the committee as soon as planning permission for the project has been received that would be expected by end April 2019. 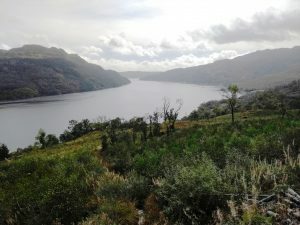 Planning permission for the project was applied for on 4th January 2019 from the Loch Lomond & Trossachs National Park and is due in April 2019 and is supported by the Argyll & Bute’s MP, Brendan O’Hara and MSP, Michael Russell, Cowal Ward Councillor, Alan Reid, Lochgoil Community Council, Forest Enterprise Scotland, Lochgoil Community Trust, Loch Lomond Community Partnership. Friends of Loch Lomond & Trossachs, Community Woodlands Association, Argyll Holidays, Rhumhor Holiday Lodge, Carrick Castle Estate & Lodge, Lodge on Loch Goil, Ardroy Outdoor Education Centre, Loch Goil Kayak Hire, Carrick Farm, Lochgoilhead Holidays, Loch Goil Trails, Lochwood House Guest House, The Shore House, Rowan House Bed & Breakfast & Loch Goil Cruisers & the Boat Shed Cafe. 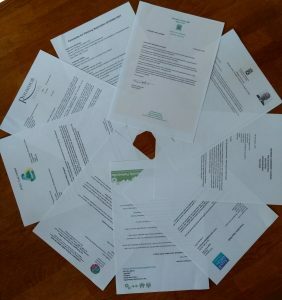 Letters of Support for the ‘Upper Cormonachan Paths Project’. ”This is wonderful news and I am very proud to belong to the Association. If I can be there on a volunteer day I shall certainly come along”. F.M. 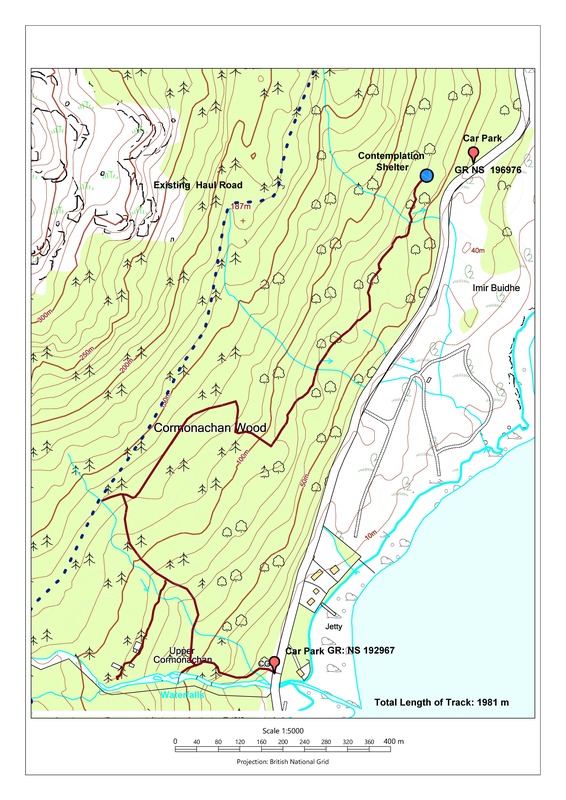 ”I spent a couple of hours on New Year’s morning walking the proposed path site with my trusty hound, we reversed the walk again two days later, she loves it too, quite steep in bits but wonderful views. It will surely be an asset to our community”. F.W. ”Thank you for what you are doing”. M.M. & J.E. 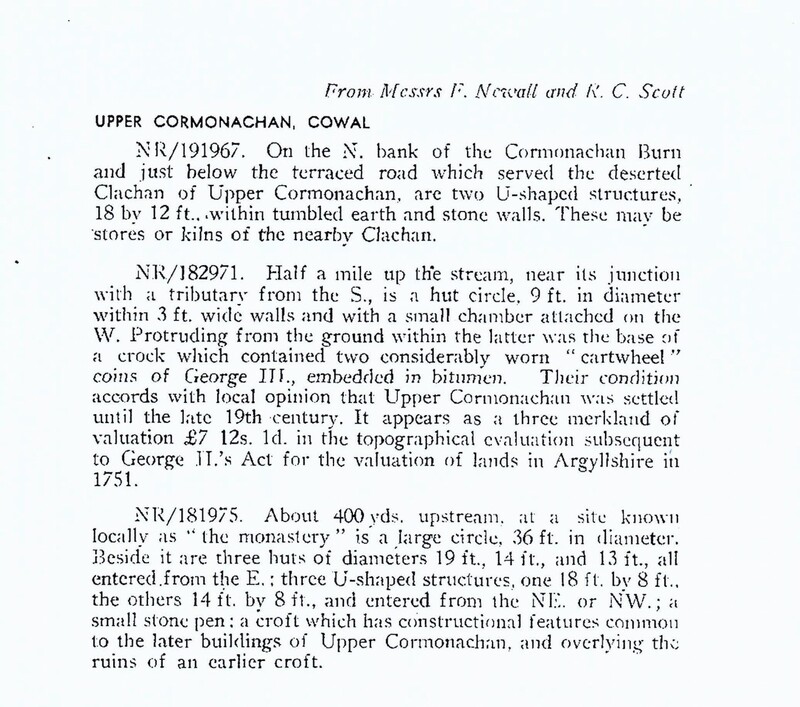 The Upper Cormonachan Project here was originally prepared in 2007. The car park would be the same size as the present car park. 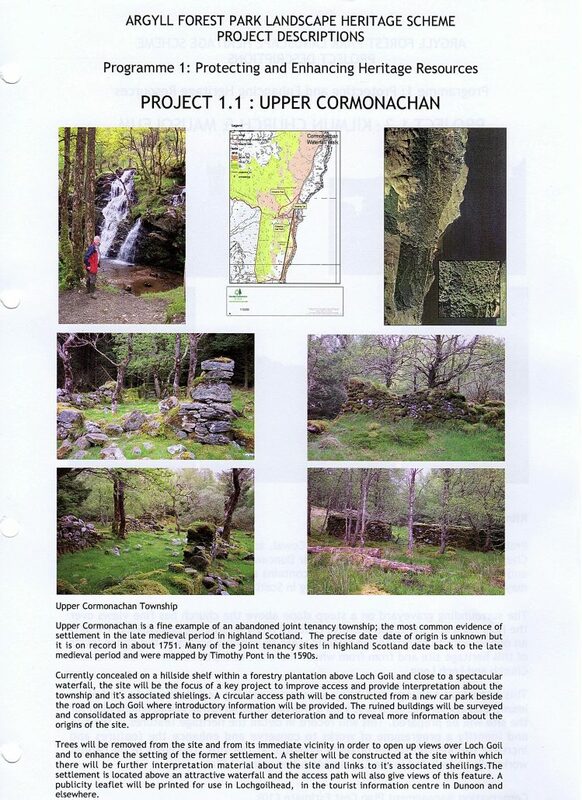 5) Obtain quotations and design for the proposed 2 km of paths from Cormonachan Burn Bridge to Upper Cormonachan old village and the Waterfalls and the Contemplation Shelter in 8 sections including 5 bridges, 4 view points and a new car park. 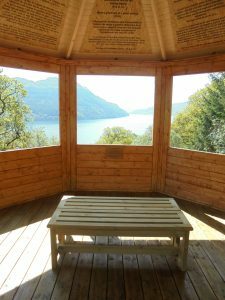 4) Contemplation Shelter in memory of our late Chair of the Association Liz Evans – Completed. 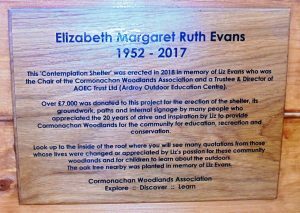 Liz Evans, Chair of the Cormonachan Woodlands Association who died on 31st December 2017 requested that at her funeral donations be made for a ‘Contemplation Shelter’ be erected at Cormonachan Woodlands instead of flowers. Liz’s funeral was held on 20th January 2018. May 2018 – Donations totalled £7,050. 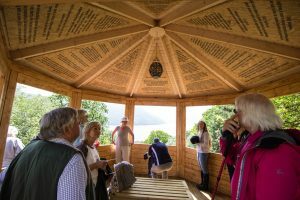 This total was enough to purchase a 3.9 m diameter octagonal shelter including groundwork, erection, signage, 2 benches and pathways to the shelter at a cost of £7,041.40 and further donations paid for planning permission (£202). 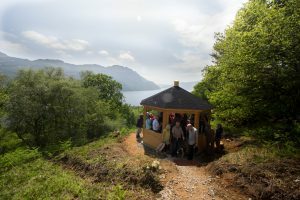 Planning permission was received and the shelter was erected in Cormonachan Woodlands on 21st May 2018 at its location at the top south west corner of the Squirrel Trail. June 2018 – The Contemplation Shelter was Officially Opened on 6th June 2018. Liz had asked for her son and husband to scatter her ashes by the shelter and plant an oak tree close by which has been done. Project completed in just over 3 months. 3) Red Squirrel Hide and Storage Shed – Completed. September 2017 – Fund raising for the above commenced. Hide plus ancillaries and sign costs £1,440.14. October 2017 – Forest Enterprise Scotland permission received for the project. October 2017 – Application made to Loch Lomond & Trossachs National Park Authority for 100% Natural Heritage Funding. October 2017 – Planning permission requested (£202.00) with plans prepared by architect member Anna Wynne without charge. December 2017 – Natural Heritage Grant Scheme approved funds of £1,440.14 for the hide and another member offered 50% funding for the shed with other members donations paying for the planning permission and balance of the total shed’s costs of £730. November 2017 – Volunteers Day (18th) cleared site area except for demolishon of existing shed. December 2017 – Total cost of Red Squirrel Hide, Storage Shed and planning permission was £2,372.14 funded 100% by grant and donations. December 2017 – Planning permission approved. December 2017 – Red Squirrel Hide and Storage Shed ordered – delivery late January/early February with erection. January 2018 – Original shed demolished (26th). 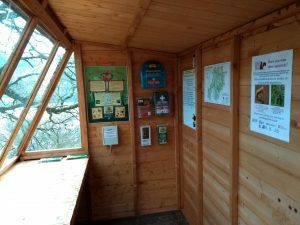 March 2018 – Red Squirrel Hide and shed erected on 12th March and hide now open all year round. 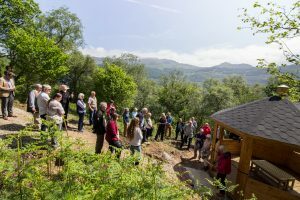 June 2018 – Official Opening of the Red Squirrel Hide (6th). 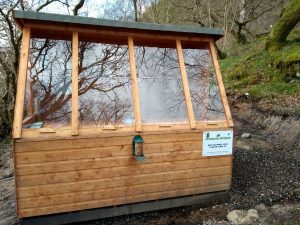 Red Squirrel Hide project completed in 9 months. 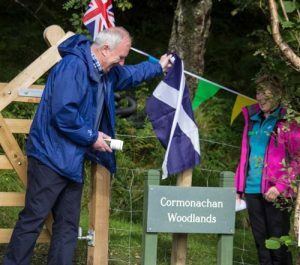 2) Sculpture Trail around Cormonachan Woodlands existing paths to commence – Completed. 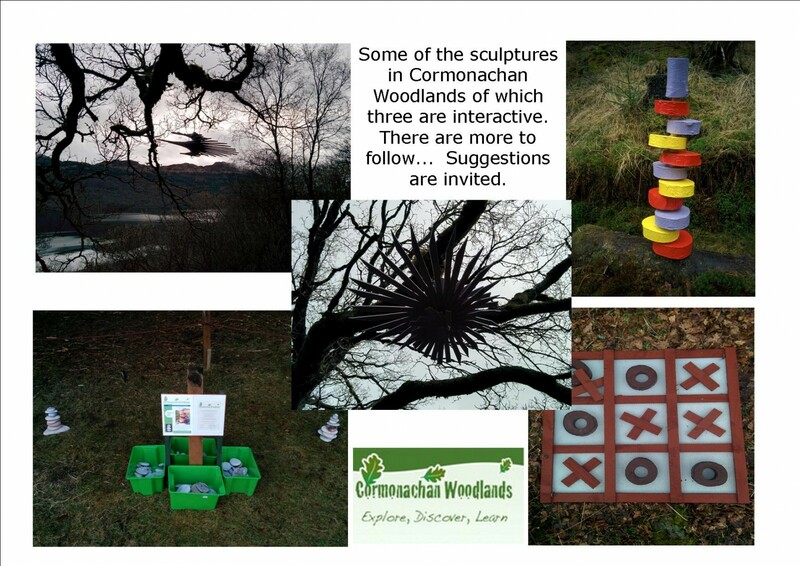 Work by local artists to be sought in keeping with the woodlands. 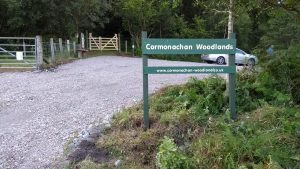 1) Extend the Cormonachan Woodlands Car Park that originally could only park only two cars to eight vehicles including a minibus and disabled parking space – Completed. May 2016 – Planning permission applied for with plans prepared by architect member Anna Wynne without charge. June 2016 – “Car Park Fund” launched to raise £4,000 for work to commence. 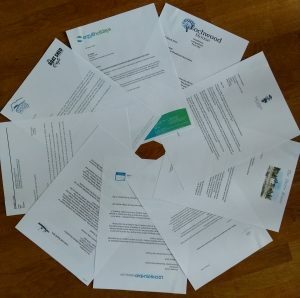 August 2016 – Two applications for funding applied for. 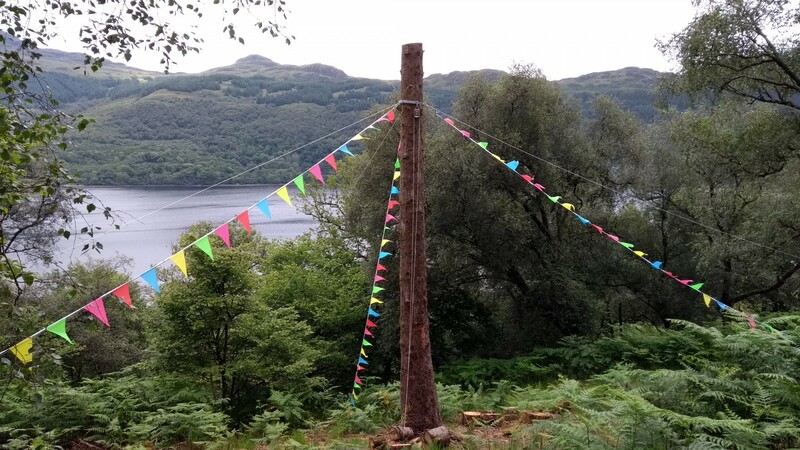 September 2016 – Planning permission received from Loch Lomond & Trossachs National Park. October 2016 – Extended car park site cleared of scrub and small trees by volunteers. April 2017 – Planning permission revised & received to add two signs and two gates. 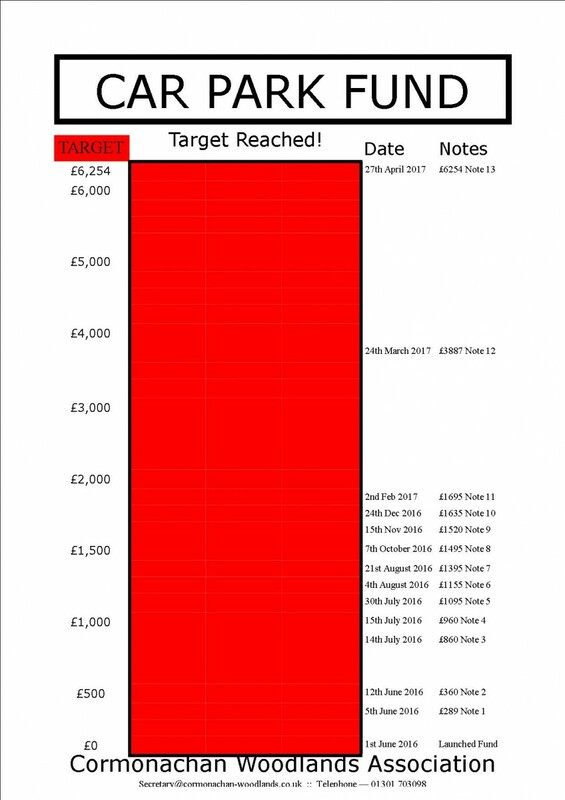 May 2017 – Funding and donations of £6,254.81 received for project to go ahead. Project completed in just over one year!